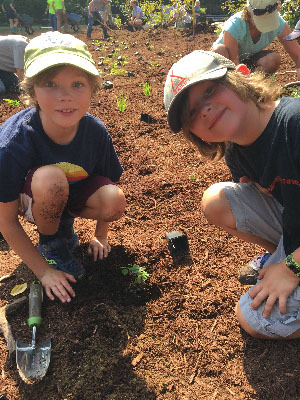 A team of Danbury-area young environmentalists joined forces with volunteers to complete the landscaping and planting around a new canoe and kayak launch on the Still River in New Milford. 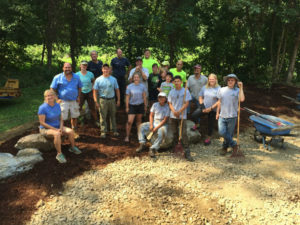 The group spent a morning putting finishing touches on a “bioswale” – a natural landscaping feature that prevents polluted stormwater runoff from entering the river. The bioswale at the new launch incorporates only native plant species which help reduce erosion and improve absorption of rainwater. Aquarion Water Company employee volunteers came from as far away as Bridgeport to assist the students with raking, planting and heavy lifting. Located on Erickson Road, the boat launch will provide non-motorized access to the Still River – a rare north-flowing river that originates near Danbury Fair Mall and empties into the Housatonic at Lovers Leap State Park. The landscaping, designed by Earth Tones Native Plant Nursery (Woodbury, Conn.), inspires appreciation of the natural environment. Trees and shrubs were specifically chosen not only for their beauty, but their ability to provide shelter and food for wildlife throughout four seasons. The project caps an entire summer of field learning and green jobs training for the students, who were selected to participate in Still River Watershed Connections. This program of the Housatonic Valley Association, in partnership with Danbury Youth Services and the Still River Alliance Committee, promotes stewardship and conservation of the Still River and the lands that surround it. “Connections” students learned about the features of a watershed, map and compass skills, botany, wildlife, and the environmental challenges facing this region. Learning was “hands-on” as they removed litter and debris from the river, and pulled invasive vines from its banks. Still River Watershed Connections is funded by the Ellen Knowles Harcourt Foundation, FirstLight Power Resources, the Horizon Foundation and the NRD Fund. Park at the Regional Animal Control facility (96 Erickson Road) – the launch is just south of the shelter building.